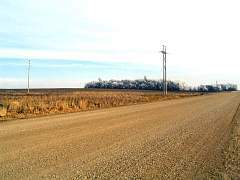 I drove out to far southwestern Minnesota late the night before and stayed overnight just above the Iowa border. I have what is perhaps my last Iowa license, and start the season at 8 a.m. in Iowa. 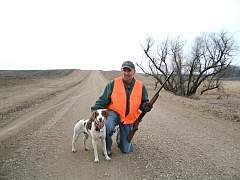 With the Iowa tresspass laws as they are, there is really no reason to try and hunt pheasants in Iowa. 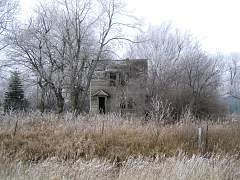 No one is home to ask permission, or else no one knows who owns the land. My stopping to hunt right here is illegal. Thus ends a 36 year span of coming to Iowa in the fall. I shot my first rooster in Iowa at age 11. 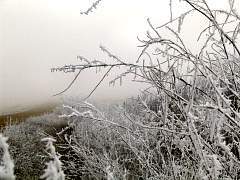 As you can see, the air has been very humid, and combined with an un-seasonalbly warm temperature of 32 degrees (freezing), visibility is poor and frost is everywhere. I got out here and walked a stream bed and fenceline. No sign of pheasants. It's after 9 a.m. and I am back in Minnesota. 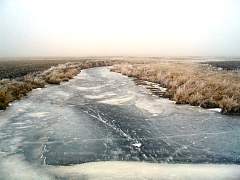 As you can see, it's been cold enough to freeze the streams, drainage ditches, and sloughs. 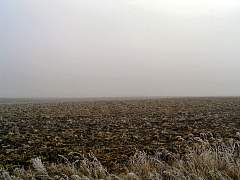 This makes it much easier to hunt the heavier cover that pheasants are in this time of year. I stopped on a bridge to take this picture. 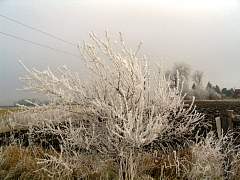 Enlarge these pictures to see Jack Frost's handiwork. 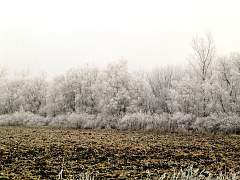 I would knock off the frost from the weeds and brush that I came in contact with, but since the temperature was around the freezing point my pants didn't become soaked. You can't see the horizon. 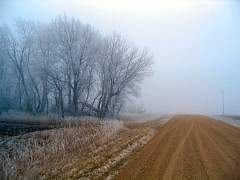 The fog is lifting and you can see all the way across this grassland and slough. Just a farm along the road. Look very carefully at this little corner formed by two roads. 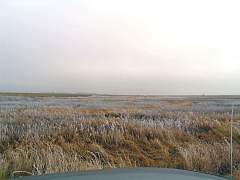 It it a little cattail slough which is frozen over. I flushed 4 hens right as I got out of the care. Walking through this little corner, I flushed perhaps two dozen more hens. No roosters - too bad. Here is a long walk I took. Down the long fence line to a creekbed far off in the distance. There is food (picked corn) on both sides of this fenceline, so the conditions are right that if there are pheasants in this area, there is a good chance they are here. One bird flushed a ways off from me, other than that it was just a long walk on a Minnesota early-winter day. Here is a picture of Dale and his dog Nick. Dale stopped to talk to me as I was finishing my walk of a public hunting area. We decided to finish hunting together - there was about two hours left in the hunting day. 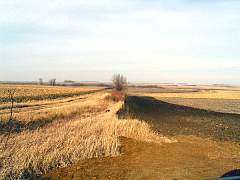 I feel pretty good that in both places I picked to hunt - a slough and some expansive CRP land, we flushed roosters. I shot a rooster on each hunt, but Nick wasn't able to find them. Sometimes a new dog needs to learn to find a downed bird, sometimes it's that the bird has run off. Nick the dog has a great nose and flushed many hens who hid from us even as we walked right up to them.